Kids Are The Future | Picture This! 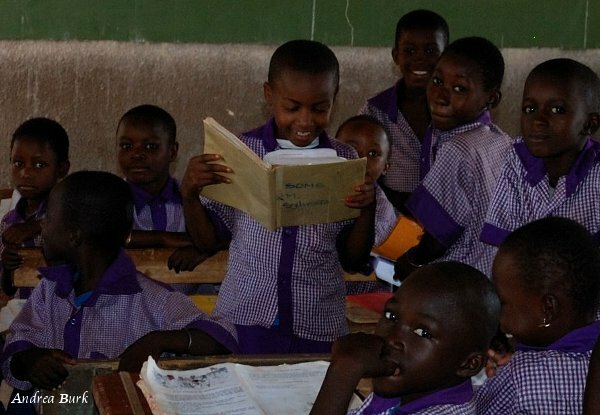 Educating children is the key to a country’s future. Burkina Faso is making progress, yet still struggling in this respect. In talking with a few people about their experiences, it was very obvious that Burkina is on the cutting edge of change, but that many are impatient and unhappy with the speed of that change. Beautiful kids in public school. 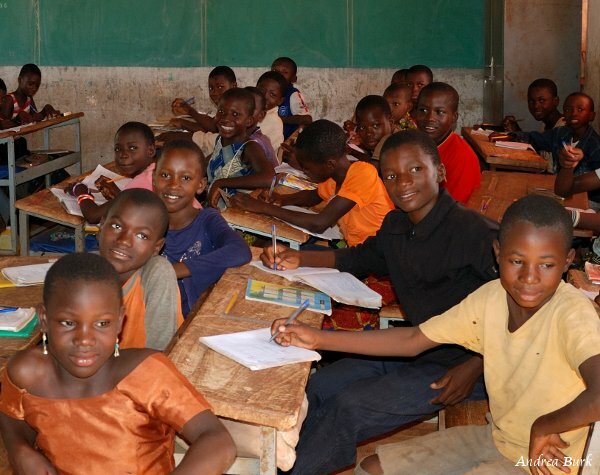 Burkina’s school system is based on the French system, since they are a former colony of France. Primary school has 6 different levels, grouped in pairs. When a student has finished all of them, he takes an exam to get into middle school where the levels are counted backwards, starting with the 6th level and counting down to the 3rd. After this, one can take another exam which allows a student to take other courses to become a teacher, nurse, government worker, etc, as long as they are old enough. After middle school, high school consists of the 2nd and 1st level and the last year called “terminale” where one studies for the BAC, a major test that determines whether or not you can be accepted into university. There is one university in the capital, Ouagadougou. There really aren’t enough schools for everyone; class sizes can range from 50-80. 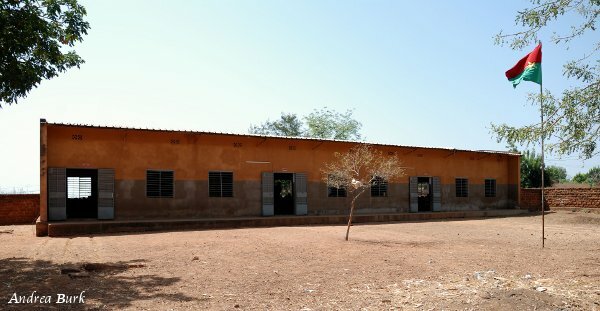 This is what the outside of a typical Burkinabe school looks like. Windows on both sides provide a breeze. As of 2010, over a million primary aged children were not in school at all. There are many reasons for this. Sometimes the parents refuse to let their children go to school because they need them in the fields or they want to teach them their job instead. They are stuck, lacking understanding of what an education can do for one’s life. Because people put more emphasis on community than individualism, the stereotypes and expectations for children to be like their parents are very strong. Other times the child is afraid to go to school because they aren’t used to so many people all at once or because they have heard that the teacher at their school hits the students for wrong answers or badly done work. Our night guard has a couple of stories about being hit in school, so badly once that he lost hearing in his ear for a little while. Younger kids in a private school. There is also a custom here of finding a young girl around 10 years old from the village to come and watch the baby of a person who has a pretty good job, such as a government worker. It’s very common to see a girl of 10 with a baby wrapped on her back in the traditional style of carrying babies here. It’s also possible for a family to send their son to work for another family. Sometimes the parents get some kind of payment; sometimes it’s just free labor for their own extended family. 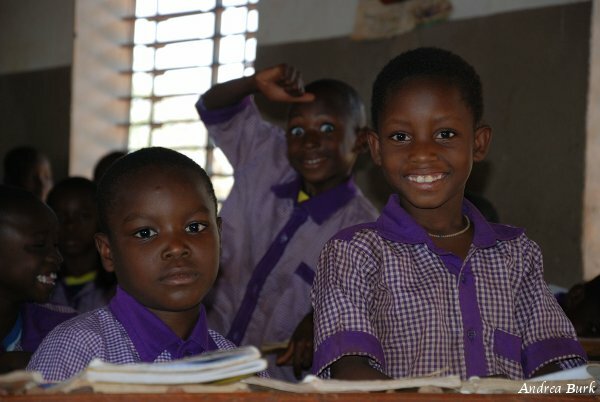 Many times, as well, girls will not be treated equally in that they are not kept in school past about 10 or 12 yrs old. Their mothers will bring them home to help around the house and then they will get married in a few years. Often there are more boys in school than girls, especially in the upper levels. The kids all have to learn French in order to continue with school. These are verb conjugations. This little boy understood me when I asked them to act like they were studying. Most seemed to still be more comfortable with Dagara. The most obvious cause for not attending school is that they can’t afford it. The costs, which would be negligible for many of us, are often insurmountable for a village family especially, but for many others as well once you count in the cost of books and materials or possibly a uniform. If they have more than one child, it can really add up. Many begin primary school but are unable to continue as prices go up for higher levels of education. For whatever reason, many kids don’t start school at the normal age of 6 or 7. When this is the case, the public schools no longer accept them so they must go to a private one. Prices are even higher in this case. Most likely, if a child’s parent dies, they will not be able to afford to go anymore either. More cute kids in a public school. This class had 58 students! Adeline has gone back to school as a young adult. In this reality of the system, many people have to stop going to school at many different levels of education. Now, however, there is definitely a resurgence of young adults going back to school to get their basic diploma which enables them to try for a variety of good jobs. They are not allowed to go to public school because they are too old, so there are night schools and tutors. 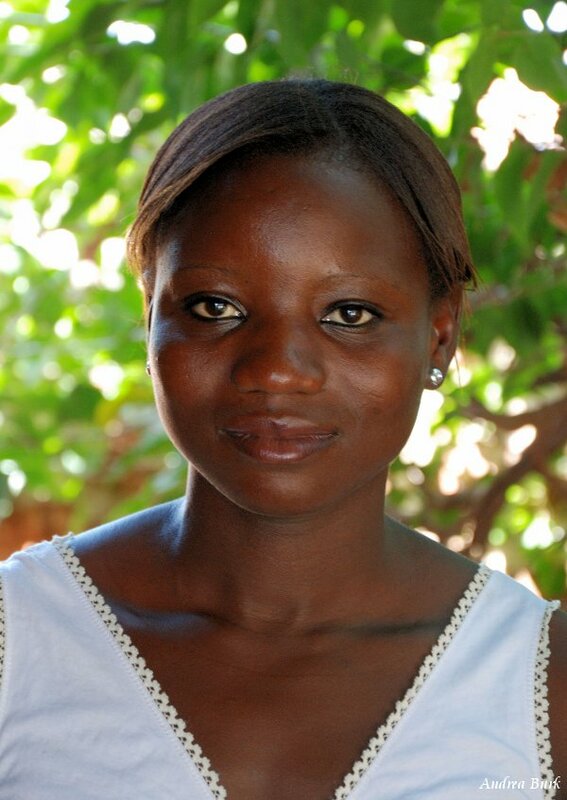 Adeline is a young lady who lost her father when she was about 14 and had to drop out of school. She has recently gone back to night school and has been able to begin again to work toward her future. She has not yet been able to afford the books, but shares with other classmates. She says that it’s been a little difficult to get back into and understand, but there is no money for a tutor. She is not alone in this situation. Fortunately, things are changing. 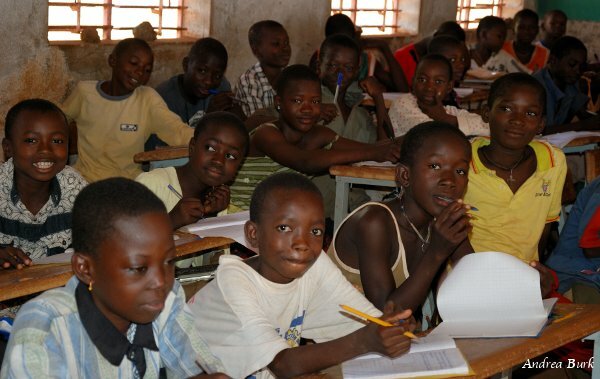 The government has made the first couple of years of school free now, is making efforts to get all the children in school, including the girls, and is really concentrating on the illiteracy rate among girls. Even among the people who shared their experiences with me, there was a different point of view depending on their ages. It was inspiring to visit the children in schools right now. They are like children should be everywhere, getting their chance to learn and grow. I had to include this one. Kids are the same everywhere, precious and unique personalities. These are the "cafeteria ladies." 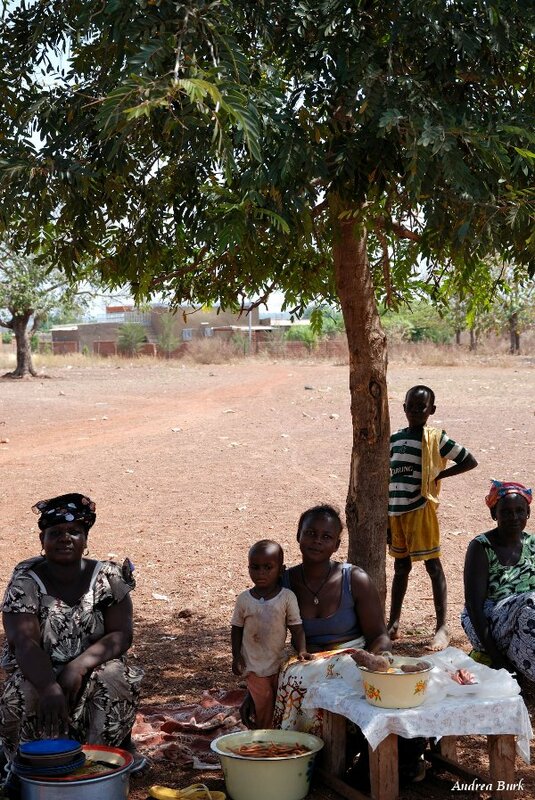 Every school has women who wait around for lunchtime to sell food to the kids. They aren't smiling for the picture, but they were a lot of fun! What do you think? “What do you want to be when you grow up?” Two out of three adults I asked said they thought about it when they were young, and when I asked a group of boys who were here to play, they all had something they wanted to be…policemen, doctor, soldier, and a boat captain (my favorite because Burkina is landlocked). How many of you thought about what you wanted to be when you were a kid? Did you feel limited by your circumstances? Did you feel if you just worked hard enough you could do it? Posted on November 11, 2011, in Uncategorized. Bookmark the permalink. 1 Comment.